Jaguar is the last of the big four manufacturers to enter this highly lucrative segment that is dominated by the Audi A4, BMW 3 Series and Mercedes-Benz C-Class. The Jaguar XE however is far from a case of too little too late and it embodies the spirit of the Jaguar XF but in a smaller package that is quite a bit lighter on the wallet. We've just spent a day with the Jaguar XE in the top Portfolio trim and it's been a fun day indeed. For the full write up on the design, features and technology, read Bert's exhaustive first drive report from when he drove the car in Spain last year. To know what the car feels like in India, keep scrolling below. This is by quite some ways the best looking car in its segment. It has a leaner, meaner looking version of the XF's already eye catching looking face and a taut, muscular shoulder line running along the side. The rear is characterised by the dual exhaust pipes and wrap around lamps that light up to look like the ones on the F-Type. It doesn't have any aggressive looking bodywork or fancy wheels (simple 17-inchers wrapped in Goodyear Eagle F1 rubber with generous sidewalls). Despite this, the XE attracts quite a lot of attention and it even managed to put a smile on the face of a cop who clearly looked frazzled with the unruly evening traffic he was dealing with in South Mumbai. Not a lot of cars do that. The cabin looks great as well with a smart speedboat like wrap-around dashboard that merges into the doors. 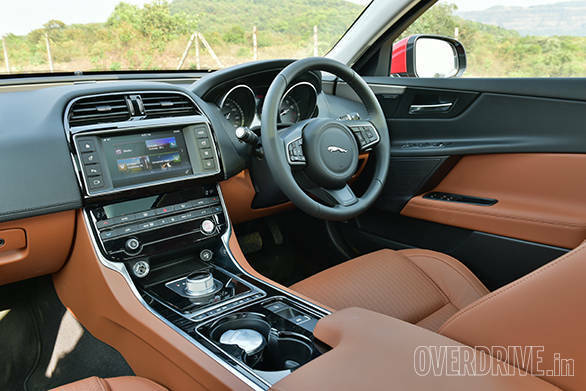 The handsome tan leather seats are very supportive and the Jaguar XE Portfolio is loaded with features including power steering adjust and a a nice sounding Meridian audio system. Jaguar's new InControl infotainment system works off a new 8-inch touchscreen display that features great looking graphics and has a navigation function. Truth be told though, Google maps are way more convenient to use. The downside with the Jaguar XE is its tight cabin. Rear knee room is just about adequate and passengers will rub their knees on the seat if there's a tall person seated up front. A very large transmission tunnel also makes this a strict four seater unless absolutely necessary to fit a fifth person in. Even the boot isn't very spacious. 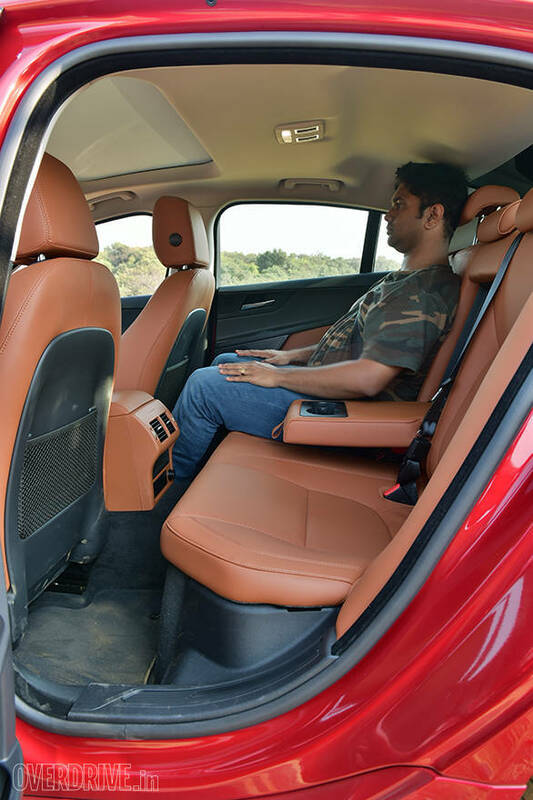 In terms of sheer space, the Jaguar XE can't hold a candle to something like a run of the mill Honda City. 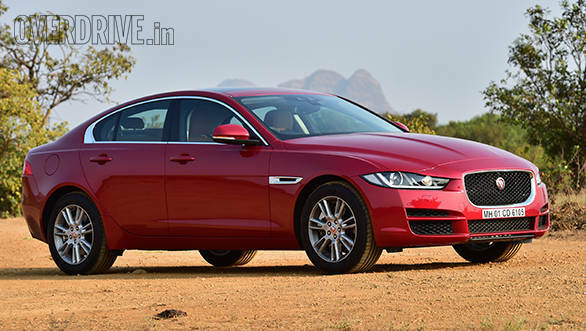 India gets two variants of the Jaguar XE, the top Portfolio and the base Pure. Both use the same engine, a 2.0-litre turbocharged four-cylinder petrol but the Pure is in a lower state of tune, with 200PS and 320Nm. The car we have here is the Jaguar XE Portfolio variant that makes 240PS and 340Nm. Both the Pure and Portfolio use an 8-speed automatic. The engine is superlatively refined and you can barely hear or feel it at low speeds. Throttle response is sharp and the engine has a very punchy midrange that builds strongly above 2,000rpm. The surge continues till just over 5,500rpm before it starts to tapers off. 0-100kmph takes a brisk 7.2s but it still cant match the now discontinued BMW 328i's 6.53s 0-100kmph time Nevertheless, the Jaguar XE feels very fast but is also happy to settle into a cruise and feels completely stress free even at 160kmph with the engine just below 3,000rpm in 8th gear. Efficiency is pretty good as well given the performance and with some careful driving we got 8.9kmpl in the city and 17.8kmpl on the highway. Making up for the cramped cabin is the fact that the driver is going to have a big smile on his face. The Jaguar XE has a sharp chassis with a quick and direct electrically assisted steering that actually offers a decent amount of feedback. On a twisting road, the Jaguar XE keeps the driver entertained with good front end grip and a rear that isn't shy to move around a little on corner exits if you turn off the traction control. There isn't quite enough power to make it drift at will but if you throw it into a corner aggressively it will willing slide. Understeer is well controlled and only comes up when the pace gets very high. Braking performance is strong and consistent and the pedal has a lovely firm feel. The Jaguar XE has a taut feeling chassis but the good news is that it is not too stiff for our roads. It feels a little firm but remains supple throughout. Even when it hits a pothole there's never that thud that makes you cringe with the fear that something may have broken. The fat tyres on those small 17-inch wheels are definitely helping here but if you don't like the look, Jaguar will sell you an optional 18- or even 19-inch wheels. Ground clearance is decent too and we didn't have any issues with speedbreaker scraping. 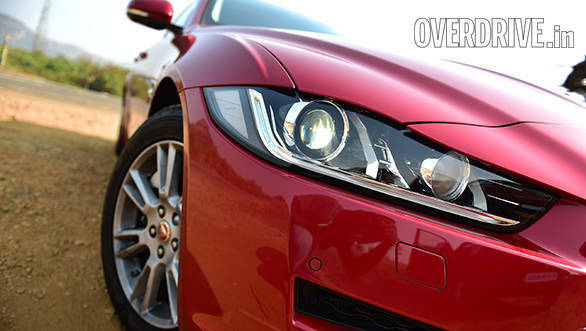 Overall, the XE rides quite well and also has excellent noise isolation. 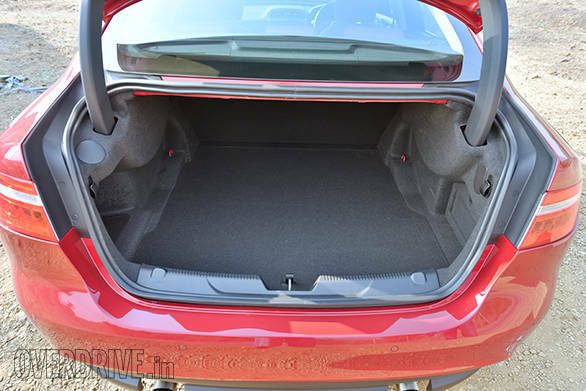 The Jaguar XE is a rather excellent car, but only if rear seat comfort is not a priority. It keeps the driver entertained and is otherwise a highly refined and thoroughly luxurious machine. 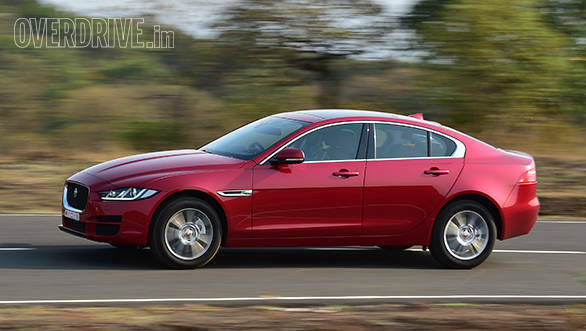 As of now, there's no diesel engine on offer and the Jaguar XE Portfolio at Rs 55.7 lakh (all prices on-road Mumbai) is quite an expensive proposition. 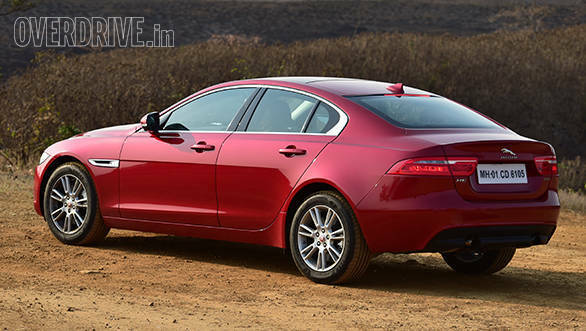 The Jaguar XE Pure on the other hand costs Rs 47.9 lakh, which is also about Rs 70,000 more than a Mercedes-Benz C200. That might sound like a much better deal but aside from the 40 less horses, the Pure also loses out on some features. Instead of a 380W 11-speaker Meridian system it only gets a 80W 6-speaker system and the bi-xenon HID lamps are replaced by a set of halogen headlamps. Even the keyless entry has been dropped. 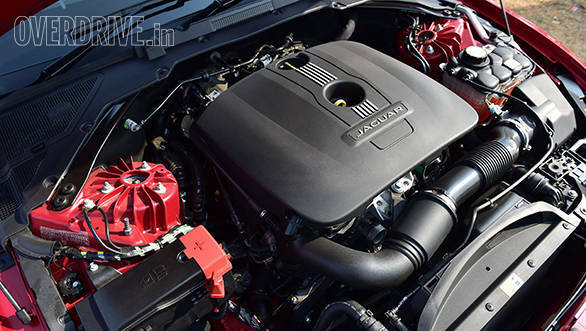 Jaguar would do well to offer a Portfolio version with the 200PS engine. Till then, watch this space to see how the Jaguar XE stands up to its rivals. We'll have a comparison coming up soon.